People who were there tell me a hundred locals were present, many spoke against the pipeline, while not one spoke for it. And the Dougherty County Attorney and a County Commissioner spoke against the pipeline. 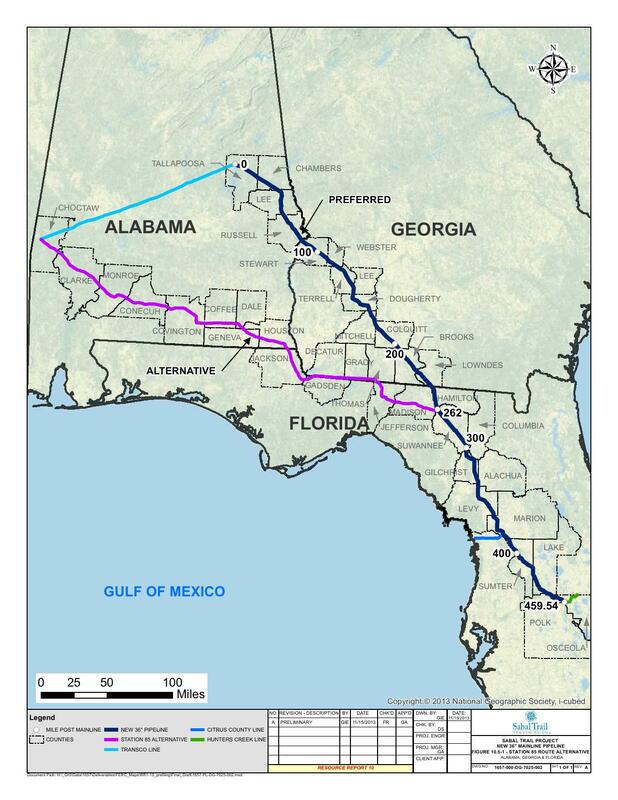 While others pondered and expounded on the complexities of the proposed 460-mile Sabal Trail natural gas pipeline projected to run through a large portion of south Dougherty County, Melvin George’s take on the controversial project was one of simplicity. “Here’s the shortest route, the one that makes the most sense: Come down directly from where the pipeline originates (near Alexander City, Ala.) to the Florida state line,” south Dougherty resident George, one of some 20 residents who spoke during a Federal Energy Regulatory Commission scoping meeting at the Hilton Garden Inn Monday evening, said. “Then let the pipeline run along the Gulf (of Mexico) and down (to Osceola County, Florida). It appears to have been the first route from at least as far back as October. Dougherty County Attorney Spencer Lee was the first to speak during the public comments session at Monday’s meeting, and he quickly set the tone for the evening. Lee’s comment drew loud applause. Outgoing Dougherty County Commissioner Gloria Gaines, who plans to run for the commission chairmanship, said the location of that compressor station concerns residents throughout the county. Dougherty County City Commissioner, Ewell Lyle, feels for a project like this, the involvement of the community is important and encourages people to attend today’s meetings and the meetings that follow.